Looking for another low maintenance perennial with mid-to late summer bloom? 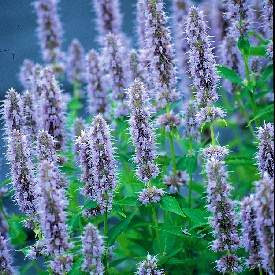 The quick pick for today’s plant is Agastache 'Blue Fortune'. Like yesterday’s Monarda ‘Coral Reef’, this perennial is a member of the mint family. Its soft lavender spikes offer structure to your sunny borders plus attracts those butterflies. It is a great companion to ‘Coral Reef’, Daylilies, Summer Phlox and “Autumn Joy’ Sedums. The combination list is endless but these are the cowboys of your summer garden: rugged and reliable. So in the words of John Wayne, “Talk low, talk slow and don’t say too much.” Good advice for hanging out on the ranch.